Acquired by a colonial administrator in the early 20th century, and has been in England since. 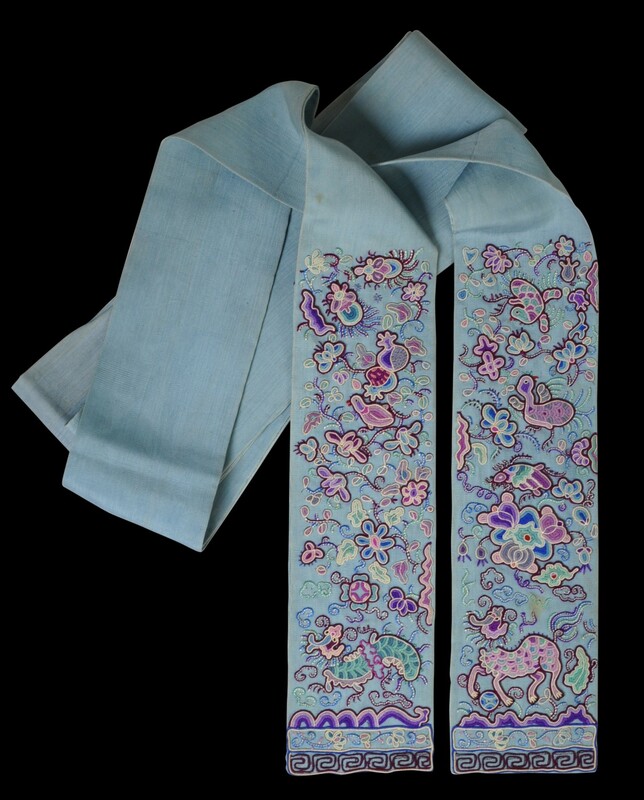 This long, light blue, silk sash would have been worn by a Straits Chinese groom in one of the Straits Settlements. 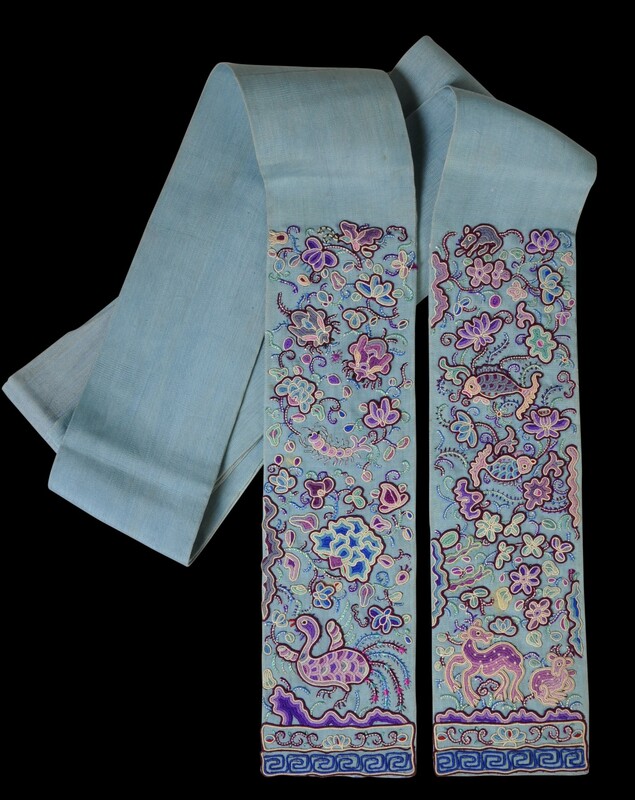 It is embroidered in fine ‘Pekinese’ knot stitching and couched in coloured silk threads very finely at each end and on both sides. 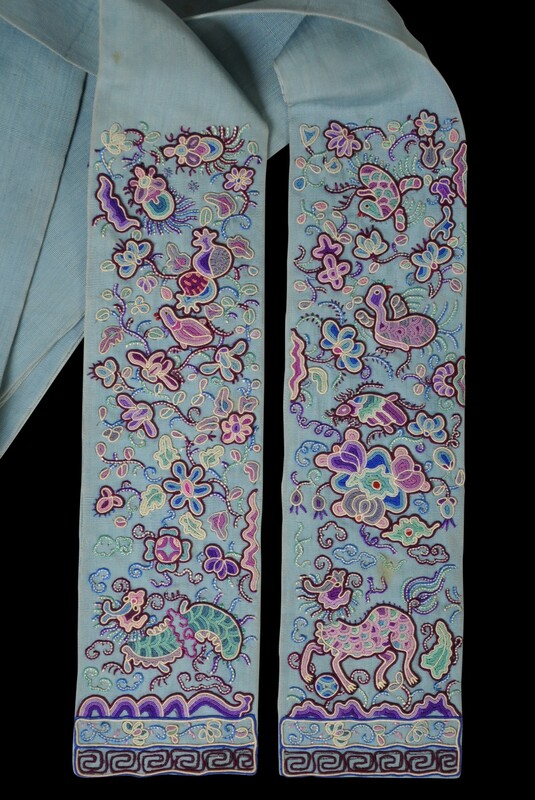 The designs, which are different on each side, are an almost seemingly random assortment of auspicious creatures such as butterflies and phoenixes and flowers, busy and eclectic in typically nonya fashion. Cheah (2017, p. 129) illustrates an almost identical example from Singapore’s National Museum. Ho (1987, p. 97) illustrates another example but in green silk. The example here is in excellent condition. Straits grooms’ sashes are rarely encountered. 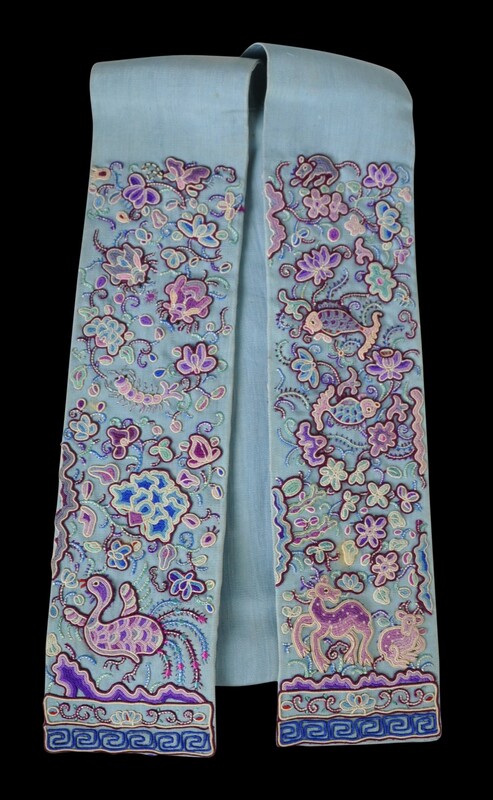 Cheah, H.F., Phoenix Rising: Narratives in Nyonya Beadwork from the Straits Settlements, NUS Press, Singapore, 2010. Cheah, H.F, Nyonya Needlework: Embroidery and Beadwork in the Peranakan World, Asian Civilisations Museum, 2017. Cheo, K.B., A Baba Wedding, Marshall Cavendish, 2009. Ee, R., et al, Peranakan Museum A-Z Guide, Asian Civilisations Museum, 2008. Ho, W.M., Straits Chinese Beadwork & Embroidery: A Collector’s Guide, Times Books International, 1987.